Tesco Home introduces a Scandi-chic feel with geometric prints, modern florals and pastel tones, while Fox & Ivy maintains its luxury look with statement floral prints and metallic touches, but also introduces a more relaxed, everyday look with earthy tones, reactive glaze and brushed gold. 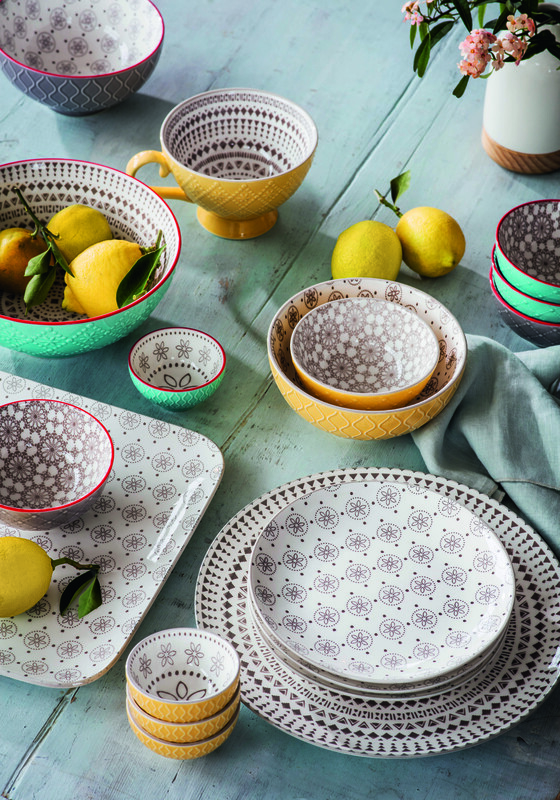 This year, Tesco has slimmed down their core range of homeware and are focusing on one style. When we saw this style a few weeks ago, we were very surprised at how affordable yet so well made everything was. Without a doubt, some pieces from this collection will be ending up in your trolley during your weekly shopping visit! With pieces from £1, you won’t blow the budget! The collection features an on-trend Scandinavian style with muted colours which can be easily implemented into any home. All the pieces in this collection are affordable and will look great when mixed and matched with your current home accessories. Designs include geo patterns, stripes, fauna prints and checks. “This season, we breathe new life into favourite accessories with a subtle palette of grey-tinged pastels, silver and chrome. Texture and finish are key, so we’ve included reactive glazes, tufted cushions and woodgrains to bring each piece to life. By keeping the colours minimal, they work beautifully when layered up to create a welcoming yet modern home.” – Steven Rowe, Head of Design.